Before you buy that next pair of tennis shoes, throw out your old ones or set them aside for yard work, you may want to turn them over and take a close look at them. Chances are they still have enough life in them to tell you something about your body, your foot placement/gait and perhaps your tennis footwork in the most mechanical sense, not how fleet, agile and nimble you are on court. I want to keep this article basic and as a bit of awareness because this topic can be very complex, but most definitely warrants attention. I don't know when feet began to be referred to loosely, jokingly or affectionately as dogs, but they are. Our feet have been dogged out since we stood from a crawl and took our first step, or tried to. They get used and abused beginning each day when we first crawl, leap or fall out of bed. First, if you have a pair (with a fair amount of wear) of casual shoes or walking shoes you don't run, juke or jive in, or a pair of running shoes you only run in, take a look at the soles for wear, from heaviest to least. Then take a look at the following link. This information is from a foot care product provider and we found their information on the topic to be well explained and easy to digest. Don't evaluate your tennis shoes just yet. Here is the link. There are other indications the soles of your shoes may provide that go beyond just the orientation of your stance or your gait. These may deal with poor skeletal alignment, tendon/ligament issues, shoe selection, etc. For more information you may wish to search the Internet using the following phrases: shoe wear analysis, gait analysis, shoe wear patterns. There is a cause-and-effect paradox here - Another physical condition may cause a gait abnormality and a gait abnormality may cause another physical condition. You may want to read some of our other articles under Fitness, Health and Nutrition and seek out other sources as well. Now let's look at those tennis shoes. If you only play tennis in these shoes and no other sport, you can learn a good bit about your movement, stopping, pivoting and other footing traits. 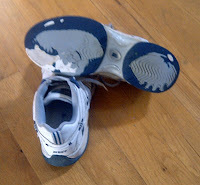 How about an old pair of my tennis shoes as I know them and my tennis game? I'm somewhat embarrassed of how far I had worn these down, but I truly didn't notice until I walked through some wet grass. The support and structure was still there and I love my shoes well worn-in. I may not like the look, but I love the comfort. Left Shoe (above left): I have low arches and I tend to over-pronate (more pressure on the inner forefoot), but my non-athletic shoe soles show all the signs of pronation including the extra wear on the outer heel. My tennis shoes don't because the majority of time the ball is in play, I am on the balls of my feet. I also love progressing toward or coming into net - additional wear on the forefoot. Before transitioning to more of a top-spin slice serve to reduce the energy exhausted and lower margin of error from a flatter, greater-power serve, I was dragging my left foot so often on serve I would need to replace a pair because I was wearing through the front toe of the shoe before I wore out the sole. Right Shoe (above right): The shoe has just about the same wear as the left except that it's a little more severe on the inner forefoot. The probable cause here is that a few months ago I began playing more doubles and have been playing much more from the deuce court. Although I love taking backhands volleys near center line, in club play one usually sees more forehand shots in deuce court. My right foot is my push-off foot and I rarely hit in an open stance in doubles. 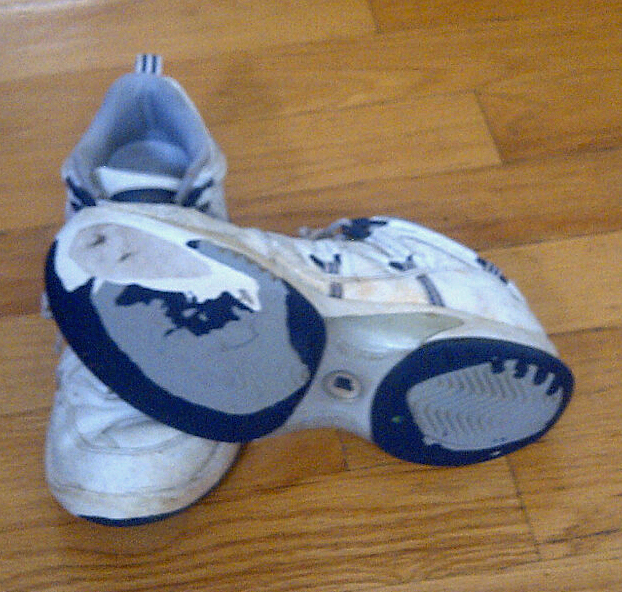 As you can see, there is much you can learn from an old shoe. Here is a very helpful video from Tennis Express. We would love to have someone more experienced with this subject or a podiatrist or chiropractor (specifically a player or with tennis player patient experience) chime in with some more insightful info.